And lets see how to summon ETs ? Stare into the sky on one spot with loving thoughts. Believe ETs will show up. Praying, meditating, singing and dancing might help. You may need to wait for sometime, as they are often testing your patience. If nothing happens, thank yourself of beings patient ! Try next day again and on and on. If still nothing happens gather a group of friends to help. You may see how Robert Bingham is doing it. We should play our role on OUR disclosure to help it happen by spreading the word and summoning UFOs !!! Although I can’t be sure if all things presented here are true, but mostly very well might be. And for sure aliens do exist, I’ll promise !!! Five for Friday #37; UFOs on sun; Space War is going on - the positive ETs fighting off the negative ones. ‘These beings are impatiently waiting for disclosure. The positive ETs keep the earth guarded and protected’. This is what Psychic Focus says – and she is not the only one, many others are also talking about alien wars going on for freeing humans from reptilians and other nasties. So no doomsday here ! Nice chat with alien “Mogay” who arrived to MUFON pleading for help, because another planet hit and caused a catastrophic explosion on Matif (their planet). Their physical body got destroyed, like spontaneous combustion, and then their spirits came to earth. ‘We coexist in electromagnetic field. If we can get more eyes, hearts and ears open to the fact that there’s so much more happening…, then we can create the changes needed to exist as One, to realize that everything is One’. His planet Matif is in another universe. http://channelingerik.com/a-chat-with-an-alien-part-two/. And more about Mogay HERE. 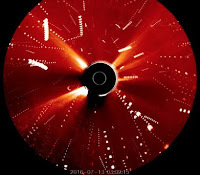 Channeling Erik about Planet Nibiru; ‘It is somewhere around, and have some effect on earth and other planets, but its orbit is not so destructive now, as it was earlier times, when it was nearer and was part of causing small ice-age. It will cause emotional unrest and environmental changes, but partly they are caused by humans too’. https://www.youtube.com/watch?v=-R9xR2JC-4Q. Niburu is a friend of our sun and came to hug her sister, but nothing dangerous going to happen. https://www.youtube.com/watch?v=1sDVsNC3hLY. Commonly channelers don’t keep Niburu that dangerous, although some effect it has on earth and other planets. So no doomsday also here ! July 20 Jet Stream Report. Jet streams seem to fluctuate and mix the earth weather badly; https://www.youtube.com/watch?v=c4-VUCyPEIk. Earth’s Magnetic Field/Rapid Movement on 20.7, he thinks it has something to do with Cern; https://www.youtube.com/watch?v=7nY5MrQYN1I. Also extra heat from sun affects the magnetic field. Black Chemtrails. They (the government) is trying to find an even more effective way of controlling weather (military purpose). http://yournewswire.com/black-chemtrails-being-reported-across-the-world/. Chemtrails; http://benjaminfulford.net/2016/07/22/fw-%e2%80%9cchemical-and-biological-warfare-program%e2%80%9d-etc/. Video http://yournewswire.com; The US Navy have admitted to testing a secret weapon off the coast of Florida that caused a 3.7 M earthquake. Max Spiers, a ‘supersoldier’, and sparring partner of James Casbolt, died in a Warsaw. https://youtu.be/OzA4orhnIXg. Channeled Max Spiers; My passing have many purposes, related to awakening. Leaving for me was essential to continue my work. I’m more important now. Non is going to believe how I died. Was it Illuminati hit, not exactly, it was time to move on. Bring truth, light instead of dark, trust yourself, love yourself. Fulford Special Update - The White Dragon Society is offering a gold bounty for the capture of the individuals listed below. These criminals have been actively trying to kill 90% of the world’s population. Since the individuals below are highly dangerous you are authorized to use any necessary force if they resist arrest. (NaturalNews) Pokemon Go, the game was actually developed by a CIA-funded software front group. It's essentially a CIA spying machine pretending to be a game, which hoards of totally brain dead apocalyptic zombie humans instantly converge on the scene. Cosmic brotherhood; Ever since the beginning of civilization, human beings have been struggling for unity and expansion. Individualism was prevailing in stone age, but later on human beings formed clans and tribal villages. At present, countries are bonding with each other. Due to technological advancement our search for unity is culminating towards friendship with interplanetary beings. Anyhow according to Indian P. R. Sarkar full participation into cosmic brotherhood is not possible until some basic factors are achieved: a common philosophy of life, a global constitutional structure, a common penal code and the fulfillment of basic necessities for all. Didi Annapurna, if you post my article, link it here, happy days!